Are you a believer of the Irish folk tale that there's a pot of gold hidden at the end of the rainbow? If not, you will become one as the legend is brought to life while you are admiring a garden filled with plants of Rainbow Happy Trails. 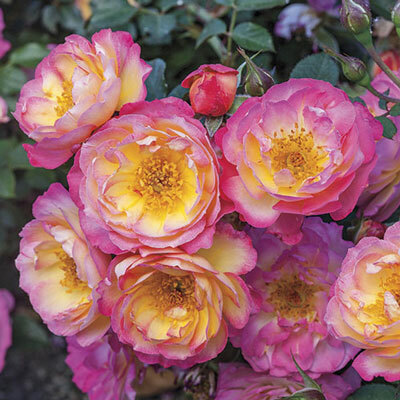 "Somewhere over the rainbow", you'll fall in love with this treasure of a rose! The valuable gold comes in the form of beautiful flowers of vibrant yellow-gold blushed with pink on the edges of the petals. This is not just a onetime wonder as the flowers are abundantly produced throughout the year. Like the everlasting glitter of gold, the flowers are non-fading, holding their coloration until the petals drop. The habit of this vigorous good luck charm is neither rounded like a pot nor square like a treasure chest. As a true Ground Cover with a trailing and spreading habit, the branches stay low to the ground to spread the rainbow throughout the garden!